Have you ever had one of those days? You know the kind where nothing goes right? Well that is how I have been feeling for the past couple of weeks! It is almost the end of the school year and my ability to multitask as a full-time mother, librarian, and blogger just isn't working. I've missed out on field trips, have forgotten to return paperwork and missed some blog posts. All I can say is thank goodness for my husband, Mr. HFA (that's short for Henslee Farm Adventures in case you're wondering ;-) ). If it wasn't for him I would have lost my mind a long time ago! My new venture, since I don't have enough on my plate, is of course selling goods at our local farmer's market (Read about why you should support your local farmer's market). Sometimes I wonder what I got myself into, but to tell you the truth I absolutely love it! The best part is that I have made some new friends. 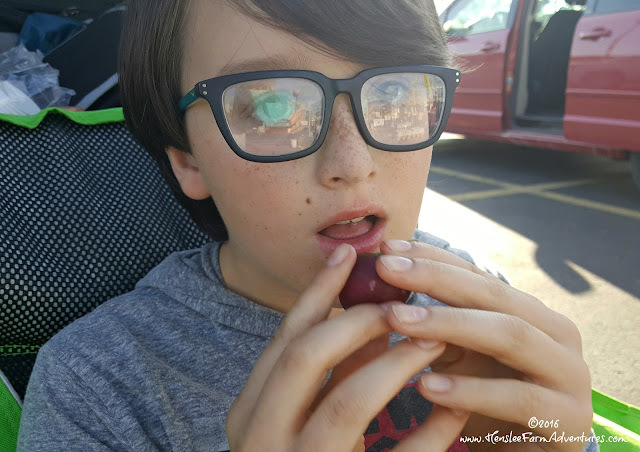 Drew enjoying one of Rema's purple radishes at the farmer's market. One of my new friends is Rema from Ford Family Farms. She grows heirloom vegetables, is very knowledgeable about her veggies, and has a great sense of humor! Talking to her has been a great learning experience for me. Whether she realizes it or not, I am learning more about seed germination and what works and doesn't work. I have had bad luck with heirloom seeds in the past because let's face it, they are finicky. However after hearing how she does it, I am willing to try it again! But gardening tips is not all she has given me, last week she gave me a beautiful bunch of heirloom radishes. Aren't they gorgeous? Ah, produce love. While I love getting produce, any kind of produce, I wasn't sure what to do with them. 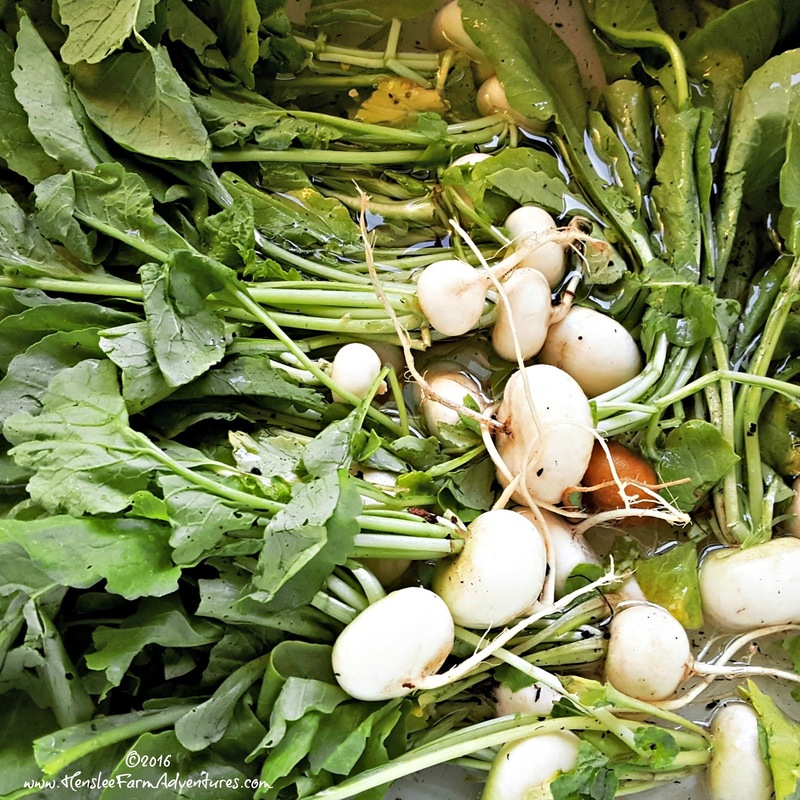 Growing up, my parents always grew radishes and they were one of the first items to come out of our garden along with green onions and leaf lettuce. But we never did anything with them except eat them raw and put them in salads. Rema suggested making pickles out of them. Pickling them sounded wonderful! I love pickled anything. Now to find a recipe. I found several recipes out there, but what I found interesting is that no two are alike. Some used honey, some used maple syrup, some used sugar. Some had pepper flakes, some had fennel. 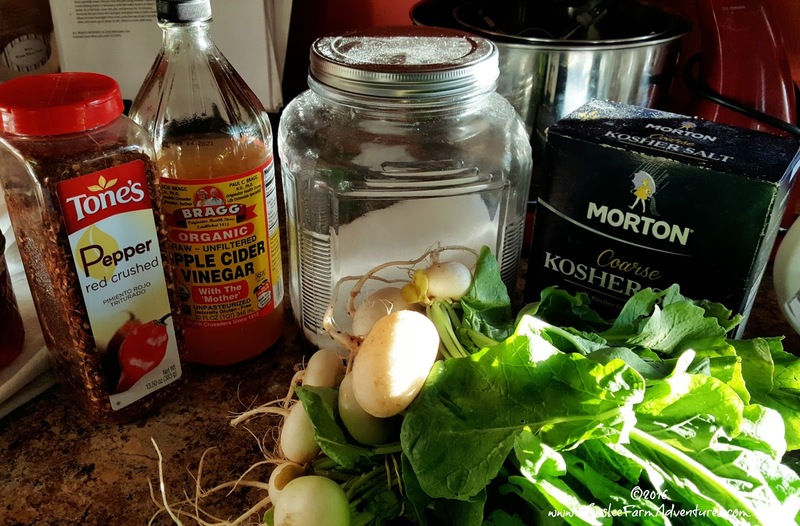 Still others used white wine vinegar, or apple cider vinegar, or even just plain white distilled vinegar. It seemed like this was a recipe that truly could be tailored to fit whatever a person liked. I want to say a little something on the sugar that I use. I do not typically use refined white sugar. You hardly ever get to see the sugar I do use, because I pour my sugar into a glass container which I have at my "baking station" in my kitchen. 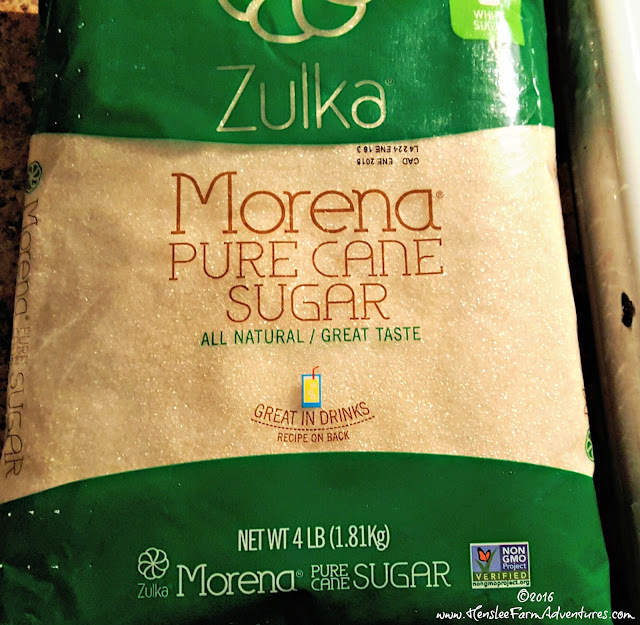 The sugar I do use is a pure cane sugar which has gone through very little processing. It is not bleached white, although in certain pictures it does look white. It is also non-GMO, AND I can get it at our local Aldi store! Non-GMO sugar, nothing wrong with that! After much debate on which way I should go, I thought I would base the recipe on my sweet and spicy pickles, which are ah-maz-ing I might add. I might share that recipe with you later this summer when the cukes are ready. With the amount of radishes I had, I was able to make 3 pint jars. I did process them in a water bath canner to preserve them. Ingredients minus the salt, pepper, and garlic cloves. Oops! Slice radishes thin. This is where I used my mandolin slicer and it did a lovely job! They were sliced thin and it took no time to do it. If you don't have one, I would suggest getting one, it makes life easier! 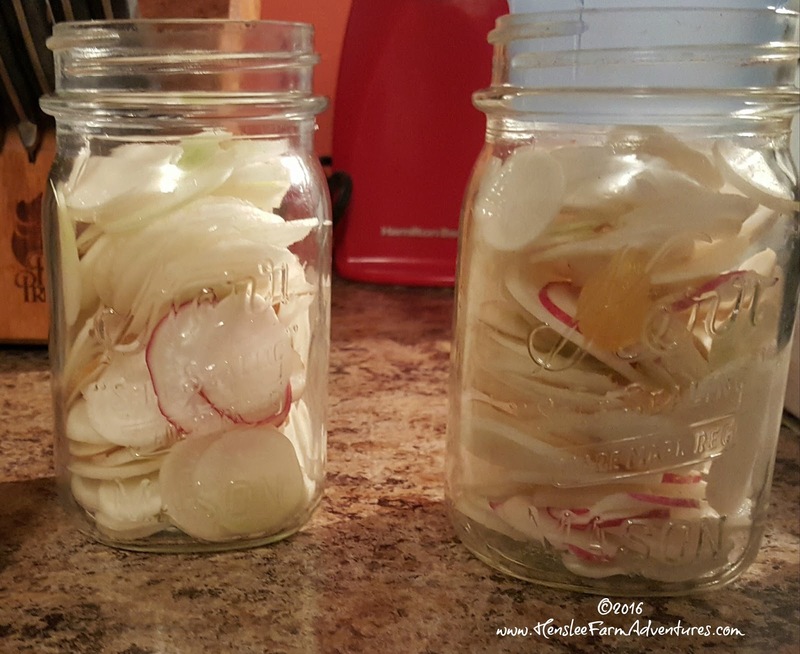 Once your radishes are sliced, put them in clean and sterilized jars. If you are using garlic, then add in the cloves of garlic too. I used garlic as we love it! Thinly sliced in the jar, just waiting for the brine. Put the rest of your ingredients into a pan and heat until the sugar dissolves. Poor liquid over the radishes, wipe off the rim of the jar and place a flat and ring on the jar, fingertip tight. Process in a water bath canner, 20 minutes for pint jars. 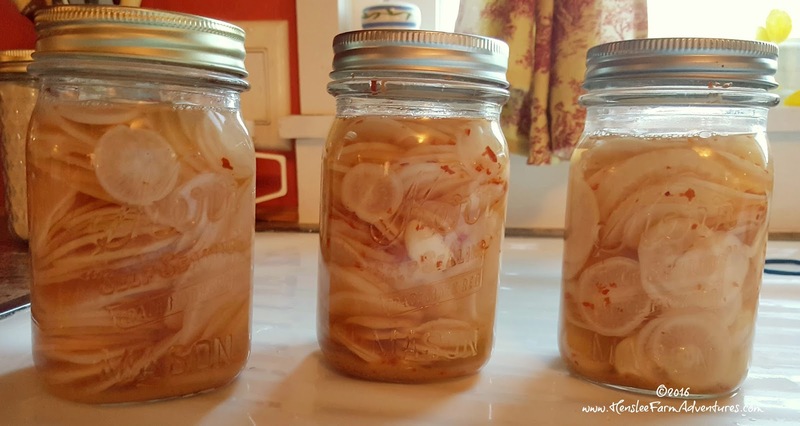 Pickled and ready to eat! That's it! If you don't want to can it, you can simply place it in the fridge and let set for 24 hours for the flavors to meld. *NOTE: If you do can this, keep in mind that when you process these it will intensify the heat of the red pepper flakes. If you do not like it that spicy, then decrease the amount of pepper flakes that you use. These radishes are a hot, tangy, slightly sweet, wonder! I can't believe that I have never had these until now! And I can't wait to grill some burgers and put these bad boys on top instead of my regular pickles. Talk about kicking it up a notch! So try these out and let me know what you think. 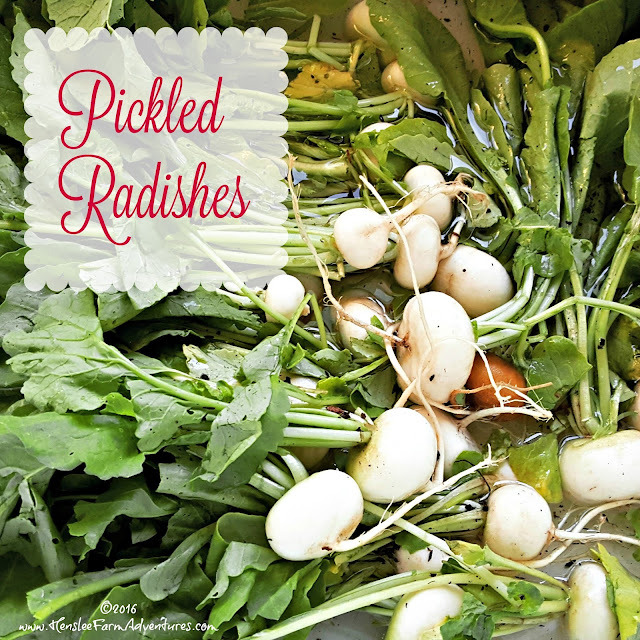 And comment below if you have ever made pickled radishes before.